I have rewritten an opening sentence to this post many times. Each time the words have found their way into the deleted folder. Truly, I am at a loss, words elude me, and you know words rarely elude me. I have read many comments made by Christians concerning World Vision’s recent decision to end discriminatory non-hiring practices against homosexuals. You can read more about the decision here. In many ways, this is the church’s front burner issue that needs conversation. The chasm is wide and there are deep wounds, deep beliefs, and deep-seated distrust , and even hatred, that exist on both sides. 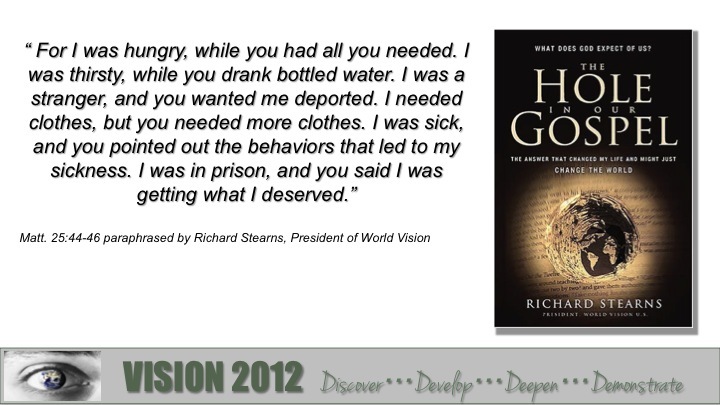 The responses that I have read by Christians against World Vision angers and astounds me. That any Christian would choose to not help communities in need and withdraw their support for vulnerable children because World Vision has chosen not to discriminate is outrageous, wrong, and definitely not Christian. In this case, whether I agree or disagree with homosexuality is not even the question. The questions are many, the issues are complex and the importance is critical, however, there are a few things I would ask those who are so ready to boycott, and disavow World Vision consider. 1. World Vision Is Not The Church. While WV is a Christian organization, they are not a church. They are a business that protects and empowers vulnerable children all around the world because of what Jesus Christ has done. Since World Vision is not a church, they are also not the theological stewards on all issues. If you will only buy product and support a business that is theologically correct according to your interpretation of the Scriptures, go right ahead, but I think you might need to live on a self-sustaining farm. Currently, 4.3 million children are being helped by sponsorship dollars. Should you choose to withdraw your support the reality is that you will affect the access those children will have to food, water, clothing, shelter, education and sanitation. World Vision’s purpose is not to be a Church and determine theological differences, they are: a “Christian humanitarian organization dedicated to working with children, families, and their communities worldwide to reach their full potential by tackling the causes of poverty and injustice.” And guess what, there are Christians who also happen to be gay. 2. Christians Should Stand Against Discrimination, not encourage it. Of all the peoples in the world, it should be Christians who stand for justice and mercy. This happens when we walk in humility. When Christians seek to force discrimination I truly wonder where their head and heart are. It’s one thing to disagree in a mature way, but maturity is not what I have witnessed. It is still possible to love and disagree. 3. Children’s Lives Are Literally At Stake. I have been sponsoring kids through World Vision for about 20+ years, and I will continue to do so. I have taken trips to visit my sponsored Kids as well as spearhead projects to fund clean water systems, sanitation and education. I am currently working on taking a group back to Uganda in the near future where we have been working together with WV to make an impact on the lives of many different people. World Vision does an incredible job and I am proud of all that they do. Truly, they are living out what Jesus calls all Christians to live out…a life that shows love, compassion,mercy, and advocacy for everyone. So I am asking that you not withdraw your sponsored child’s support. I also don’t think Jesus would ask you to withdraw your sponsored child’s support either. There is a greater story going on, and to allow a child to suffer because of theological disagreements is ludicrous and lacks compassion. I assure you, this decision was not easy for the leadership of WV to make. It was not made in a vacuum and not made without much prayer. I sense that their decision reflects the organizations global purpose and also shows that they long to see discrimination abolished everywhere, even in the United States. It’s time for a deeper dialog on this issue rather than entrenched polarization. Ultimately, when we allow religious politics to trump love, everyone loses, especially the children who are being helped in Christs’ name.